OS X allows you to add TLD specific resolver configurations. Quite popular ones are /etc/resolver/vm for local virtual machines and /etc/resolver/dev for local development purposes. Go seems to be hardcoded to only take /etc/resolv.conf into account on Unix platforms. I don't think Go-native DNS resolving mechanism is used on Mac. which means that OS-native DNS resolving is used. Can you supply an exact configuration file, Go code, actual and expected output? @nodirt This is for a binary with cgo off. to use the Mac DNS resolver, plese build with cgo. @nodirt https://github.com/nodirt This is for a binary with cgo off. Shouldn't be a problem since this is needed only on a dev machine. In this specific case, @Rotonen was using the Flynn binary that we distribute as a compiled artifact, it is compiled without cgo to ease cross-compilation. Just because the user is a developer doesn't mean that they are a Go developer or want to compile the binary for themselves. The only question here is if this feature is out of scope for the pure-Go resolver. cross compilation with cgo-enabled net package is not that hard. You can reuse the package contained in binary distribution and force internal linking. I don't see anything wrong with supporting the OS X /etc/resolver directory. 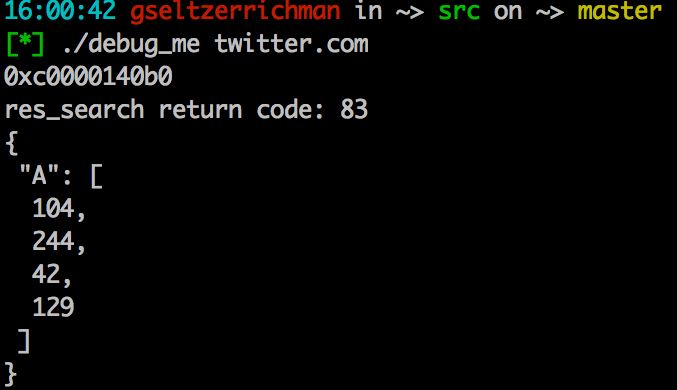 That said, my understanding is that the Go DNS resolver does not work well on most OS X machines. That is why it is disabled by default. This would be great in all platforms anyway. Is there any disadvantage from supporting this behaviour? It seems that it'd neatly resolve the need to install and configure dnsmasq to provide the simple function of having different resolvers for different TLDs. i know this issue is quite old but has there been any traction on this? Any updates would be posted here. No updates have been posted here. See resolver(5). Just reading the files out of /etc/resolver/* will miss out on other mechanisms for configuring the same thing, for example configuration profiles or IKE attributes. Just stumbled upon this today while attempting to use coredns as a dns proxy for local development. It's a real bummer to discover how naive our support for os x is. We've generally assumed people use cgo on Darwin, so this bug has never been a priority. I do admit that practically means that Darwin binaries need to be built on Darwin, which is difficult for people wanting to cross-compile for a dozen platforms as part of their release process. Perhaps on Darwin without cgo we could just shell out to a program to do DNS resolution (e.g. host, dig, nslookup?). At least nslookup has an interactive mode that would permit re-using a child process for multiple lookups, if that proves necessary for performance. I think reality is most command-line utilities will compile for two platforms: Linux and OS X, and the OS X build will always have cgo disabled. Some subset of the OS X users are using VPN, expect .local names to resolve, or have some other situation where hostname resolution is more than "just query this one DNS server always". Some subset of those users will actually open an issue with the tool, and of those even a smaller subset identify go as the problem and raise an issue here. So I think you underestimate the impact of the problem. If DNS is to be used, determining which server to use. Tools like host, nslookup, and dig do DNS queries by design, not resolve hostnames. This is equally true on Linux as well as OS X. Unfortunately somehow OS X has acquired some lore about having "two DNS systems", which is simply false. Or at least it was false, until go command-line utilities gained popularity. If you do want to shell out to a command to perform host resolution, the correct command on OS X is dscacheutil -q host -a name $hostname. This is analogous to getent hosts $hostname on Linux. Another path is to make the go resolver's behavior more consistent with the OS X system resolver. This begins with obtaining resolver configuration from SystemConfiguration.framework or scutil --dns, not /etc/resolv.conf. dscacheutil sounds good. I was thinking of lookupd when I wrote the comment above but my local machine didn't have lookupd so I omitted it. Now I see that dscacheutil replaced lookupd. I don't think we want to get into the business of reimplementing Darwin's name resolution. @randall77, since you're having fun with macOS lately, any thoughts here? Could we have non-cgo binaries still call into the macOS name resolution code somehow with some assembly/linker goo? Let's see if we can use the libSystem bindings directly even when cgo is ostensibly disabled. I actually expect .local names to resolve on all platforms per mDNS anyway, if the target responds to the broadcast appropriately. @bitglue is correct. I think a lot of people are going to file issues against a tool and not raise issues to the Go project. A good example of this is Homebrew. They recently removed support for options in their install which now means people can't install packages written in Go, like Hashicorp's Vault with cgo support. We used to be able to do 'brew install vault --with-dyanmic' to enable cgo support to get correct DNS resolution, but now that is removed and we're stuck with having to hack their install script to get Vault compiled with cgo. It would be nice to see Go's native resolver work in a less naive fashion so we don't need to worry about this issue anymore. I would chime in and venture that the root of this issue might be that the net package treats all Unix systems the same. Perhaps there should be a stubbed out variant for MacOS to deal with it's configd based resolution? This issue, as has been noted, will affect every binary not compiled with cgo when users are using VPNs, which would seem to be a common use case. @rsc Can you provide some detail on how we might be able to call libSystem bindings without cgo? @grantseltzer The current runtime package is full of examples of calling into libSystem. See runtime/sys_darwin.go. Anything glaring that i'm missing? Perhaps my datatypes or stack offset sizes. Most importantly, can someone link me to documentation on how to debug the code at this level? Still not there yet though. Anyone have a hunch of why this call isn't working or have advice on debugging? I am getting DNS records using the libresolv res_search binding with cgo disabled :D! Working to confirm that this actually honors the /etc/resolver files, not sure if it is at the moment. Current update: Calling this routine does in fact honor /etc/resolver/ files. I'm currently trying to figure out an issue where the specified query 'type' is not being honored and only AAAA queries are sent. Should this routine be defined for all of i386, x86_64, ARM, and ARM64? What testing mechanisms exist for code at this level beyond manually? Should the cgo bindings exist in runtime or are they appropriate for the net package? from scratch; currently enabled by netdns=go. However, I'm still not sure we really need to hold all of the implementations in the package net. Is there any specific reason not making a new API that accepts external stub resolver implementations? Once we open up the API, we are also able to use the API for upcoming fancy technologies such as DoH (DNS over HTTPS). The last MOVL is using a DI value that just got clobbered in the previous instruction. You have to load DI last. The manpage is unclear about what the return value of res_search is. You might need to call libc_error if the return value is <0 to get an actual error code. See mmap for an example. Debugging this stuff is hard generally. Sorry about that. It does seem that you're making progress though. By the way, if Darwin supports res_nsearch and friends, we should probably use them, as they are thread-safe. res_search and res_nsearch normally return the length of the response and I assume the same is true on Darwin. @ianlancetaylor I have been working on this today, as well as changing the GODEBUG/CGO set logic discussed on gerrit. In order to use res_nsearch we would have to use res_ninit. I don't know whether res_search would also work OK, but it's troubling that it's not considered to be thread-safe on GNU/Linux. I don't know about Darwin. I don't know when the global variable is modified. But I guess that to use res_ninit and res_nsearch we would need to at least know the size of res_state. Probably the best approach would be to double-check that on Darwin res_state is <= 512 bytes, as I expect it is, and then use uint64.